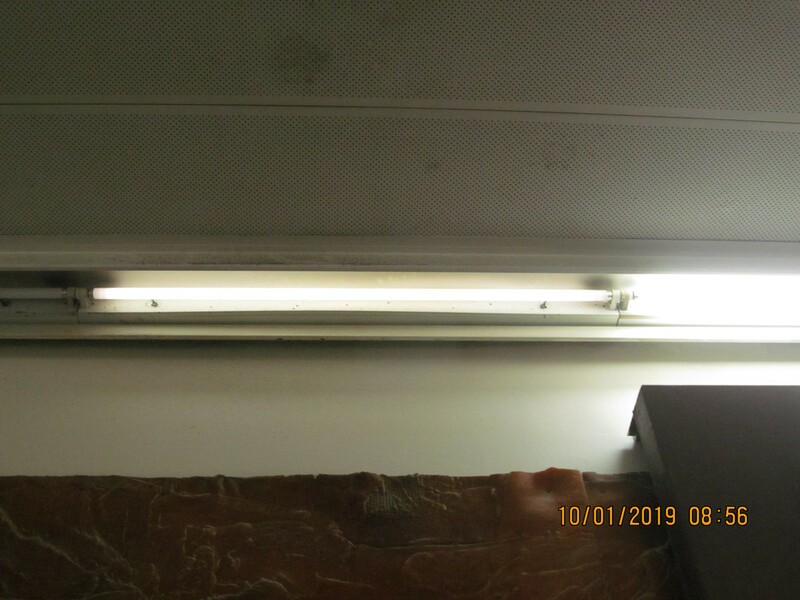 As you can see: The Osram L 36W/765 T8 lamp near the auditorium of Carmel hospital is mercury starved, since the spectrum consist of only krypton and mercury lines and a weak emission of the halophosphors, so the states that Andrew (Globe Collector), posted in the two links above are false. Mercury can react with the phosphor, glass, electrodes and other lamp materials. 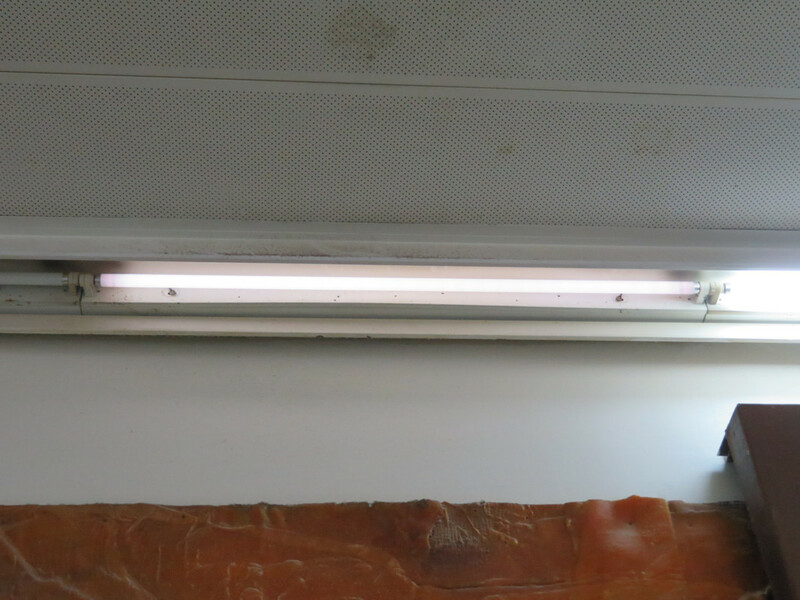 When a fluorescent lamp getting impurities from outside, its ignition voltage rises to the breakdown of the air, and won't start at all. If it start at a strange color but warming up to white color after than, capture the spectrum as fast as possible, before it would warm up, so you can see the emission before the remaining mercury vaporize. I've seen spectra of mercury starved CFLs: It consisted only the triphosphors emissions without the mercury lines, as they are more sensitive to the argon UV radiation than the halophosphors. The lower the CCT, the redder the light would be. Tubes postulated to be air poisoned exhibit almost no fluorescence at all and get very hot. I have made the postulation that the effect shown at the other end of the link above is due to air poisoning, the correct way to prove or disprove this postulate is by experiment. If the results of the experiment agree with the postulate then the postulate becomes a theory.....if enough peer reviewed experiments are performed that agree with the original postulate then it effectively becomes something so close to fact that it may as well be considered as fact for all intents and purposes. This is effectively how the scientific method works. If the results of experiment disagree with the original postulate, then that postulate is abandoned and either another (different) postulate is offered by the same source or different postulates from the peers of that original source are made and, again tested by experiment to see the experimental results agree with and support the new postulate. If so, the new postulate (mercury starvation) becomes a theory and, eventually, with enough peer reviews and experiment, fact. I postulate that the observed effect of low luminous flux, high operating temperature, lack of phosphor fluorescence and alteration of emitted spectrum are as a result of a few ppm of air permeating into the tube through the meniscus seals at the exhaust tip(s). I also postulate that the electrical impedance of the tube is altered in such a manner as to draw more power from the available electrical supply in order to justify the ultimately higher bulb wall operating temperature. Other members of LG (including yourself) have stated, (presented seemingly as fact), but accepted (by me) as an untested postulate, that the observed effects of low luminous flux, high operating temperature, lack of phosphor fluorescence and alteration of emitted spectrum and electrical impedance are as a consequence of either mercury loss by some mysterious process or adsorbtion onto lamp materials of high surface area, presumably the phosphor as the most logical culprit. Why is the mercury not adsorbed into the phosphor (or any other lamp parts of lesser surface area for that matter) in every other tube which functions as its manufacturer intended? How is the electrical impedance of a tube so afflicted, effected? Does the alteration of electrical impedance account for the delivered energy to account for the observed high bulb wall temperature? What does the spectrum (high resolution, (>1nm/mm))of a tube so effected reveal? Are there any broad (c10-30nm wide) polyatomic, (molecular) emission bands in the said spectrum? Is there an almost total absence* of atomic mercury emission lines in the said spectrum? *i.e. Mercury resonance lines at 186 and 254nm have been quenched by more than 90% and visible emission lines of mercury have been quenched down to a similar intensity to the emission lines of the cold-fill inert Gp-VIII gas. Is there an almost total absence* of very broad phosphor emission bands in the said spectrum? The postulate of "mercury starvation" does not address ANY mechanism to explain the high bulb wall temperature. My postulate of air poisoning addresses this issue at a plasma physics level. In order to answer most (if not all) of these questions one NEEDS to study the tube CAREFULLY on a laboratory bench, not up in a troffer on the ceiling of a school. shopping centre or train station! Your spectra's resolution is so low one is unable to resolve the lines of Krypton. (Bright) Mercury lines, (437, 546 and 580nm can just be made out as can the green triphosphor band, but barely. One would have no nope of seeing any Group-VIII elements' lines apart from maybe neon. The presence of mercury lines disproves your postulate that this in "mercury starvation". I have urged you to fit your spectroscope with a slit to improve the resolution, but, so far these requests have fallen upon deaf ears. and, access to the spectroscopy gear....(and, no a DVD alone does not posses the resolution). Another, even simpler experiment would simply involve measuring the tube's current and voltage drop with a True R.M.S. multimeter and back-calculating the impedance, of even simpler, comparing the readings with a set of readings made on a tube of the same type and ratings not so effected. When I am in a position to get one of these effected tubes onto my bench, I will be running as many tests as possible on it to see if they agree with my postulate. In the meantime the offer goes out to any LG member with access to such an effected tube (and preferably one of the same type, rating and manufacturer that is NOT so effected, to use as a control) to carry out those tests for themselves and post the results.....i.e. peer review my postulate with experiment. I think you should check the difference between a, "big fat lie" and a postulate/hypothesis before using such emotive terminology in a private message! And don't blame it on the cyber translation from Hebrew to English! I feel you are surrcombing to peer pressure and simply "following the mob" ...." because they all say it, it must be true" ethic of which most of us humans are so afflicted, rather than turning to first principles and extracting the true answer form the only one who currently really knows the correct answer...THE TUBE ITSELF! Firstly: I edited the description so it don't looks offensive. Sorry that I called your things such. Secondly: Remember than the argon and krypton produces UV wavelengths that aren't short enough to excite the halophosphors, but enough to excite some components of the triphosphors (Mainly the red one, hence the reddish color of some 827 and 840 fluorescents when they reaches to this state), or other phosphors that are used in fluorescent lamp. In the case here, sufficient mercury vapor emission remained to excite the phosphors (In the case daylight halophosphors). When the mercury emission will be completely gone, only the krypton lines will be left in the spectrum. See here for the spectrum of my father Osram HO 54W/865 Germany lamp, when it is glowing pink, barely mercury emission from the center part of the tube, but the triphosphors glowing because of the argon starting gas. I don't have an easy accessibility to a spectroscope, and it is a hard project for me to build a home made spectroscope, that will even last. Those "lines" you see dor, they are coloured images of the tube itself. The yellow one is actually TWO images that overlap each other. You have to make the images narrower, you need a slit. You need to get an image at least this good....note the two yellow lines..."You can drive a truck between them". You need that here! I simply cant repeat myself often enough! I know the REAL reason why you can't make or purchase a spectroscope, but I don't really want to be forced to spell it out to you letter-by-letter. It is nothing to do with you or your abilities/disabilities at all, it is nothing to do with me either, or any other LG member, but rather someone else altogether....someone who continually "puts you down", someone who continually tells you that you can't do it, someone who could help you but chooses not to....but you CAN dor, I know you can, and when you do, a whole new world of wonder will open up to you. You are mach smarter than you think, but you have been told that you are not for so long you believe it and it traps you in an invisible cage. You simply can't make a cake with just flour and water, you can only make bread...very basic bread....you have been doing that for years now...but now it is time to get some eggs, sugar and milk and make a REAL cake! I don't think that the two green lines are two image of the same line, based on the fact, that the yellow line appears only once, and after it, there is an orange line, and in the blue a very weak single blue line. I think that what I see are both the lines of mercury and krypton together. There are some similarity between the optical spectra of low pressure mercury and krypton. Read my post above again, dor, all of it.....carefully! It seems to me that you are now capable or READING written English quite well. How well do you think you can cope with SPOKEN English? e.g. from a You Tube video? You meaning that the yellow line are actually two lines and not one like how it looks in this image? I thought you meaning something different. Sorry. From some reasons I though you meaning that the two green lines are two images of the same line. It is sometimes hard to me to understand even simple things that people says. Yes, dor, I can see your question....yes, that yellow line is actually two lines. The green lines...one is a single (atomic) mercury line at 546nm, the other is a broad green band from the green phosphor in the TriPhosphor.....but the resolution is so low they both look like atomic lines. So I repeat...like a "stuck record"...How well do you think you can cope with SPOKEN English? @Andrew: This isn't limited to English. This happening to me even in the Hebrew language. It is hard to me to read long and complex text. And regarding to the other green line: The lamp is Osram L 36W/765, not Osram Lumilux L 36W/865, so it have a halophosphors coating. If the other green line would be a band of the green component of the tri-phosphors, this would be visible also in my CD-R, as a blurry green picture of the lamp. 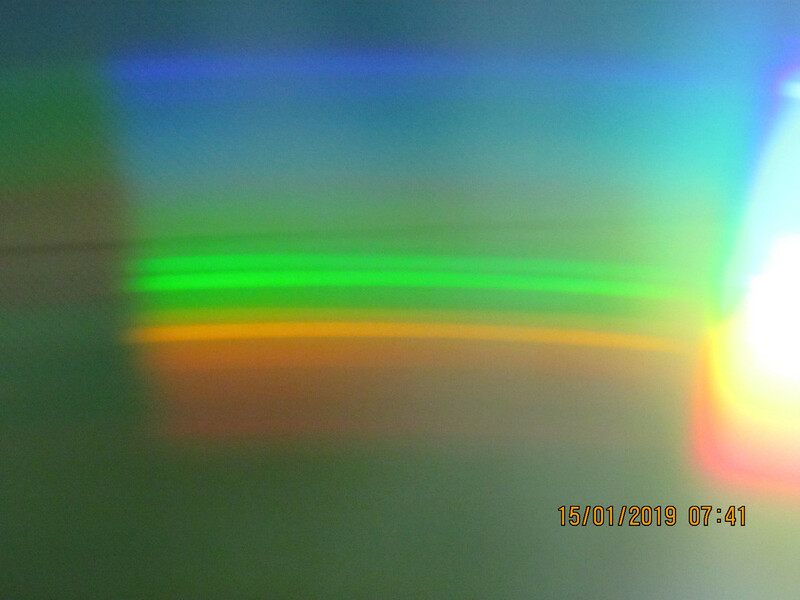 Notice that the spectra on my CD-R, looks much better in the unaided eyes than through the camera, since the eyes can play tricks that the camera can't. I am NOT talking about WRITTEN Hebrew or English, but SPOKEN English. I will link a video here with SPOKEN English...I want to know how much of it you understand? See if you can understand Tony Attwood speaking about the abilities of those with Aspuruer's Syndrome.....like you and I. Spoken English I don't understand well, so I can't talk with English only tourist and students here in Israel. But the closed captions allows me to understand the spoken English. However the video is long, and I fearing to see it, since in the program, there are several people in the panel which may laugh which is disturbing me, and I also don't know if this program is recorded before a studio audience, which can also disturb me. Facebook isn't a platform for me. Nor, is it "for me" either, but I watched the video! Would you deny being carried to the doctor on a bicycle, just because you can't ride a bicycle? Guys, why you argue. No need. The lamp is glowing pink.... Big whoop... It looks cool.. I also like it when they fail with one end glowing purple. Let's leave it at that and not bicker. We are both Aspies Owen! I'm a mature, socially acceptable Aspie, able to hide it in social situations, but he still has social issues because his family won't trust in his abilities...but I trust in his abilities and as another Aspie, I believe he has far more potential than he is aware of...and I'm trying to draw it out of him. He is very stubborn because of his situation, but hes a really intelligent guy but just needs to communicate it properly. Addressing the lamp...there is the "Truth"...the actual physics of what is going on inside the plasma column of this lamp, and it is important to understand the mechanism at the plasma physics level because that explains what happens at the marco level, lack of phosphor fluorescence, very hot bulb wall etc. A large number of members here on Lighting Gallery use this term, "mercury starvation", but it has little basis in the physics and seems to be a game of "follow the leader"....i.e. because he said it, I will repeat it....but I won't verify of it is correct before I repeat it, probably because I am unable to go back to first principles and critically think about it. When you use the term "Big Whoop"...you are brushing off an opportunity to learn and go deeper...and I sincerely hope it is not as a consequence of your (degrading) school system over there. Be aware of your "enimies" Owen, awareness is most of the way to protecting yourself. I'm not having a go at you Owen, even though you may perceive that I am. I'm just trying to increase your awareness of what is going on around you! Go back to the MBI-H post, there's a whole lot more stuff there you may not have seen yet. Decided to watch the video. I didn't managed to follow the fast changing subtitles and read them thoroughly. Most dimmed fluorescent lamps that I've seen and used my CD-R to analyze, were actually mercury starved, since the ones with triphosphors, have their phosphors active, and the one here showing krypton lines alongside the mercury lines and the phosphor is still active. Again, dor, how can you hope to see the myriad of (dim) krypton lines with such low resolution? Answering Owen, but feel free to read too dor! Dor is far more intelligent than you might think, but he is constantly "put down", not so much by members here, although it does happen....but more by those around him at home. It has been happening to him so relentlessly and for so long that he has become trapped in an invisible cage of their construction. I, as sompne who was once trapped like him, for the same reason, are trying to be one of the only ones who believes in him, who believes he is actually far more capable of doing things and discovering things that the people around him will lead him to believe. The fact he has discovered how to use a DVD as a monochromator is just amazing....would you have thought of that? The monochromator is the heart of a spectroscope and a spectroscope is the instrument that analyzes the light to reveal many of the secrets of how light sources actually work. 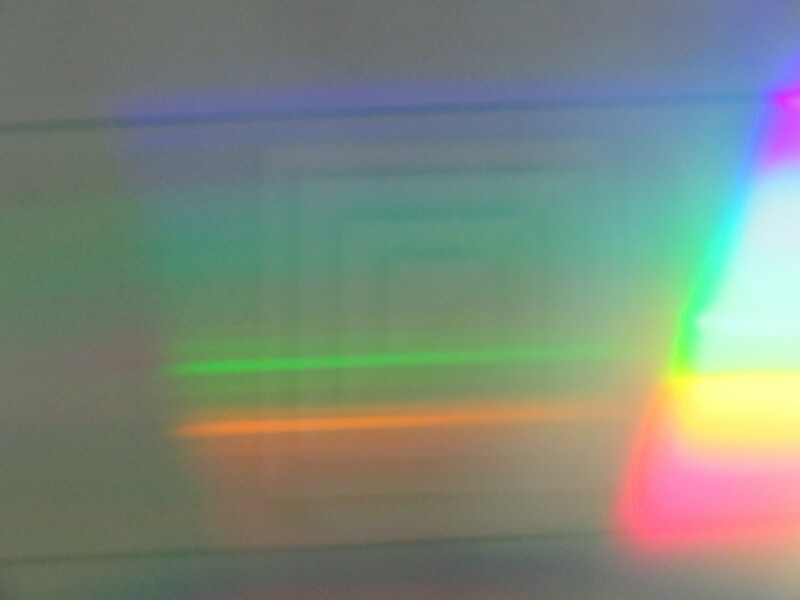 So dor has taken the first few steps down the road to being a spectroscopist, an activity that fundamentally reveals many of the secrets of nature. There was this famous French philosopher, I think his name was Andre le Kant, (I'll try to look him up later...that's what Google and the Internet make so easy) ...anyhow, he lived about 1820 ...so about 200 years ago. Astronomy was really getting gong then and lots of people were studying the stars, trying to work out what they were and how far away they were. Andre le Kant was right in the midst of all this and was recorded as saying, "Man can never know the stars, man can never find out what they are made of or how they work!" Well, what a "goose!" We now know these things about all the stars around us out to about 100 light years and also about many of the brighter ones further than this. We can also deduce this about all the stars that we can see, both in this galaxy and all others! But how! How did we find out? Well spectroscopy was one of the more important methods that "opened the door a crack" and then let us use other tools to find out more that corroborated the findings of the spectroscopists. Aspies, those with Aspurger's Syndrome, like myself and dor...we have very narrow interests, Astronomy, Lamps, Chemical Elements and compounds....we focus so intently on our interests that we often go far beyond what others are capable. Many influential achievers are Aspies or have Aspie-like traits and these are very often the ones that break new ground...like work out how to control gravity...because most of the non-Aspies are too busy socializing and bickering with each other, they just can't stay focused on the problem long enough or intense enough to have much effect. I like the analogy of burning your name into a piece of wood using a magnifying glass out in the sun. Most people just can't hold the magnifying glass either still enough or at the correct focal distance to achieve any result...but the Aspie holds it still, at the correct focal distance and perpendicular to the sun's rays and achieves a result. I know dor is capable of much, much more, he just lacks self esteem, so I'm hoping to give him enough to place a slit in front of his monochromator and take the next step up the ladder to being a spectroscopist...he may never get fully there, but even to get one step closer is an amazing thing. Very few here see his potential, but I see it crystal clear...he just has to have the gumption to face up to those over there with him who constantly "put him down". I will never relent on him until he fits the slit to his monochromator...and when and if he ever does, a whole wide vista of new discoveries will await him. The problem is not actually him...it is those who stand behind him and block his way, he needs the gumption to get past their barriers to a world of wonders beyond. Your case is simpler...if your school system has failed you in any way, it may not have done, but then you need to compare the school you went through to one the little snobs go through or one that is considered a "basket case". I hope you read that article I linked to fully and "filed it away for later". Even over here on the other side of "The Duck Pond...(Pacific Ocean)" we are deeply concerned about where your country might be headed and many others are too, but that is another story for another day. If you feel your school system has somehow let you down, somehow not revealed stuff to you you feel it should have done, or you just "drew the short straw" and got a whole pile of crappy teachers*** then you can still "short circuit" it yourself by teaching yourself. Read books..I can give you a list if you like, but Carl Sagan's "Cosmos" is a damn good starting point. And in this day and age of "Mr Google" a whole world of literature, mathematics, geography...etc. etc. is just under your fingertips in the form of your computer keyboard or iPad screen! You simply need to develop the discernment to filter out all the irrelevant guf, (like constant and incessant advertising) and "tunnel through" to the "gold dust" beyond. He has many more if you want the URL's. All of these woyld make excellent teachers....why, because that have been out there and done it! ***What makes a poor teacher? One who left school, went to teacher's college and then went back to school again. They never left the school system. They were taught to teach, but not WHAT to teach! If you wish to learn cabinet making, you learn from a cabinet maker, if you wish to learn welding, you learn from a welder...no teacher can teach everything, and if they think they can they are a fool! Actually there is a fourth American I greatly respect, from Colorado or Arizona I think, female and ASPIE....Temple Grandin. If you ever have any problems or quires, feel free to ask. I have aspergers aswell. I don't flash it nearly as often. Nor are my interests completely narrow. I feel like you make alot of assumptions about peoples personal lives without any actual knowledge of what happens in their life. Who's to say I went to a public school, private school, homeschool, who's to say I paid any attention to half the crap they taught? Who's to say I don't read books or absorb knowledge on my own? The person to say such things certainly is not you since you lack any connection to my personal life aside from LG. I don't know what connection you have with Dor outside of LG message boards and comment sections, but if you have none who are you to assume he's been ridiculed his whole life? Perhaps there's more than one or no underlying issues. You simply cannot know things without knowing the person. To be quite frank when people assume what ones issues are it pisses me off and it's insulting. I have no problems with you as a person. But I don't like the assumptions you're making without any background to support it. Also who's to say I ever thought Dor was not intelligent. There is infact a language barrier being dealt with. But I never once said or suggested he was dumb. I did say this argument should cease simply because he doesn't seem to understand what you're trying to say. Maybe type shorter sentences that go through Google translate better or find something in Hebrew. He's already mentioned that he's having trouble understanding you. I reckon more than 50% of the members here are Aspies, Owen so you being another comes as no surprise. After all, this site has a lot that appeals to people like us. I do know some things about dor's situation, enough, otherwise I would not be trying to draw him further down his path of interest. I believe he is not really being bullied, but he is being held back from his full potential. I would love to see him learn to solder if possible. He has been on LG long enough to get functional English and he is slowly improving there, although languages are difficult for Aspies, I admit. I do have Hebrew speaking friends here if I really need them. It isn't him, its just his situation, if that can be improved he could really come out of himself. I have to chime myself into this subject. I recently found out from my mother that she reported that I do have selective autism due to the delay of my primary language delay and my hearing disabilities. In the 1960s there were some group of people tried to forced children with hearing disabilities learn the education through oral. I did not learn more until I was seven when I started to learn sign language that paved way to me into the mainstream. I could not grasp the normal language from surrounding from surrounding people talking. I didn't even get a hearing aid until I was 2 1/2 years old on my bad ear. Finally, I had the hearing aid moved to my better ear 6 month later that I was able to hear what's going on. There were some things that I did do some self teaching such I learned how to do cursive writing when I was about 8 years old. @rjluna2: By meaning "hearing disabilities" you mean "ADHD"? I think I've ADHD as well. Here is an article related to Autism, PDD and Asperger at ALUT website: Google translated link (Untranslated Hebrew link) . No, dor123. I have hearing loss. 95% loss on my right ear and about 60 to 70% hearing loss on my left ear. I don't think that hearing loss are a symptom of PDD/Autism. Hearing loss can still give problems socially, mainly because those with hearing loss sort of slur their speech because the can't hear themselves to correct it. Others often misinterpret this as some sort of mental deficiency. Over time their speech improves and adults can usually speak very well, but as little kids, they yell and yell and yell simply because they either can't hear themselves at all, or only a little bit. He as 0% in one ear and 4% in the other (least he did last time I spoke to him about five years ago.) He told me is is gradually loosing even that 4%. He uses all sorts of "cues" hearing people normally don't pick up upon...like when he drives is ute, he feels what the engine and transmission is doing through his bum on the seat! He has had two bionic ear implants, the first was not very effective and I don't know much about the second as I haven't seen him for a while. My brother-in-law also has severe hearing loss, again I think it is the auditrory nerve...his ears actually work but the signal does not reach the brain. His loss is genetic, his mother has it too and it has come right down through their family for generations. I think he has about 10% in one ear and I can't remember the figure for the other. He also lipreads quite will but I have never seen him sign either. Both are about 60 years old now. You are correct dor, there isn't really any correlation between hearing loss and autisim, but that's not to say that people with both don't exist, which would be really unfortunate for them as kids. Andrew and dor123, please see my PM. Hmm, interesting...I have always wanted to capture such a spectrum...but still dor, your resolution is so FRUSTRATINGLY low that you cannot really tell lots of overlapping lines of argon or krypton from a possible molecular continuum due to air, (just a few ppm) inside. Still quite an intense yellow and green. I assume the green is the phosphor, what is the yellow? P.S. I am thinking of sending you a spectroscope myself as you are so intransigent when it comes to making or otherwise acquiring one for yourself! Solving this conclusively requires high contrast and very narrow, fine line images...it also requires a big collecting lens or very long exposures to drag the necessary details out. Again, and I feel like a parrot squawking, or a "stuck record", your resolution is TOO LOW! The lamp is Osram L 36W/765 T8 halophosphors, so the green line can't be from a phosphor, also it would be blurry if it would such. The second line is orange, not yellow, which is a sign of krypton. Lets talk about this in the PM.